Enjoy Sun, Sea, And Adventure By Jet Ski! The Florida Keys are infamous for our endless supply of beautifully warm, sunny days. It’s fortunate we enjoy such amazing weather since there are so many awesome things to do and see around the Keys that involve being outdoors. Options abound, so it’s time to get out there and explore all that South Florida has to offer! One of the best ways to get the lay of the land (and sea) is to head out on a jet ski. What better way to take in the shimmering blue water and white, scenic beaches of Southern Florida than with the wind blowing through your hair and sea spray providing a refreshing cool down? Key Largo is positioned in such a way that you can easily head out and take in the vast expanse of the Atlantic Ocean or the Gulf of Mexico — or book a longer jet ski rental and experience both on the same day! There are few feelings as freeing and exhilarating as cruising along open water around Key Largo on a jet ski. It’s a must-do experience for visitors and locals alike! When most people think about the Florida Keys, they tend to think about beaches and oceans, not forests. And yet, we’re home to one of the more unique forests on the planet! There are miles upon miles of mangrove forests along the main peninsula. Mangroves grow in an unusual way; the tree itself is raised above the water but an impressive root network anchors each tree or shrub to the earth below. Most trees can’t handle the heat, salt, looser/muddier soil conditions and high winds that mangroves deal with. The roots of a mangrove not only look impressive, but they also help the plant to survive some otherwise inhospitable conditions. Better still, the weaving network of roots creates ethereal-feeling pathways and canals perfect for a unique adventure. Jet ski rentals are a great option for exploring the mangroves because they’re a shallow enough craft to take you deep enough into the winding pathways that you’ll feel like you’ve fallen into a fairytale setting. Coral reefs have always been a major world wonder for scuba divers and snorkelers. They’re a bold ecosystem teeming with fascinating creatures — made even more interesting after delving into the fictional world of Finding Nemo. What’s surprising to us is that so many Americans don’t know that there’s a coral reef system much closer to home than out near Australia! The Florida Reef is North America’s only living coral reef system, and it’s just a short jaunt away from the Keys. Grab a jet ski rental and snorkeling gear, and you can head out to explore all of the amazing colors and wildlife that abound. The reef system runs all along the Keys, too, so there’s plenty to explore. A jet ski will help you take in multiple miles of the reef in one day, and it’ll allow you to get closer than a motorboat without undue damage to the reefs. Just be sure you follow the guidelines for approaching the reefs to protect this special ecosystem. Why: Because you want to explore the water! 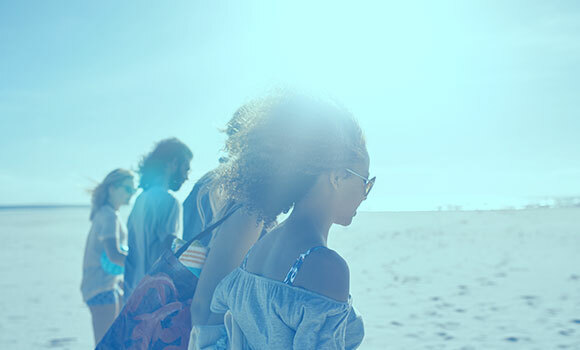 Our online rental makes it easy to book right now with real-time results for the date and time you want to take an adventure. Click below to begin booking your next Jet Ski adventure tour! Book Jet Ski Rentals Now! Jet Skis are a great way to explore the adventures of the ocean and waterways. SoFlo is home to beautiful scenery. The view is fine from the shore, but you can’t beat it from out on the water. Adventure on a jet ski where your feet can’t take you. The possibilities are endless. At Keys Skis Watersports, you can rent a jet ski to tour around the water. Tours are offered in a semi-private setting, with up to six watercraft per tour. Each jet ski can hold up to three people, or it can be driven solo. If you’ve ever seen a jet ski chase scene in a movie, you may think that jet ski rentals are only for the thrill seekers and experienced seafarers. That’s not the case at all! Jet skis aren’t just for the adrenaline-junkies, they can just as easily be a great family-friendly adventure. 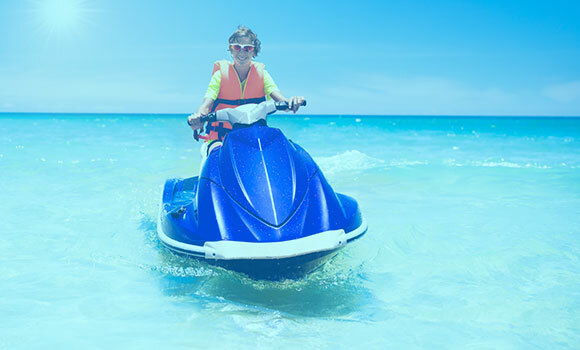 You can fit up to three people on a jet ski, making this a fun option for families traveling with kids who aren’t old enough to handle their own jet ski, but who don’t want to miss out on the adventure. Check with our team if you’ve got specific questions about age and suitability. You don’t need to be experienced to enjoy a jet ski rental, either. The team here at Keys Skis & Adventure will teach you how to safely use the craft before you head out. We’ll also make sure you feel comfortable and answer all your questions before you head out on your own. 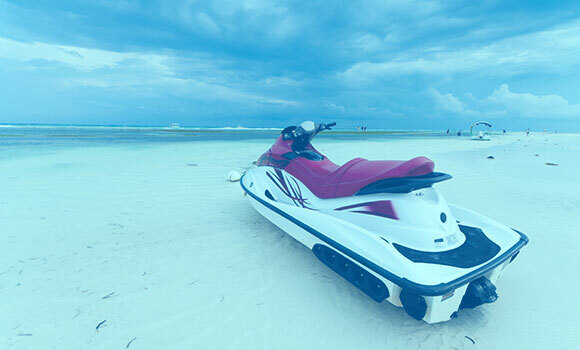 For those who feel unsure or who have never been jet skiing before, we also offer jet ski tours with an experienced guide who can take you around to those must-see spots around Key Largo. Of course, we want you to be safe and feel comfortable on your jet ski adventure. We recommend starting slowly and building up speed as you feel more familiar with the controls. We’ll also provide guidance about safe speeds to use based on where you want to explore. You’ll need to keep speeds lower when going through mangroves or visiting the reefs than you will on open water. This is for the safety of your group and for the environments you’ll visit. Mangroves and reefs are both valuable, thriving ecosystems that provide a great many benefits to the planet. Slower speeds help protect those environments without ruining the exploratory fun. Another safety measure we always recommend is to grab life jackets any time you’re heading out on jet skis. Yes, even if you plan to slowly amble your way through the mangroves, even if you’re experienced jet skiers, and even if you’re all strong swimmers. We offer life jackets in our store, or you can bring your own. Either way, life preservers can help prevent unanticipated accidents from putting a damper on your experience. If you have any other questions or concerns before your jet ski rental, just give us a call! The Keys Skis & Adventure team is happy to share our extensive knowledge and help you better prepare for your jet ski adventure. Enjoy the beautiful sights of Key Largo, the Atlantic Ocean, inland waterways, and The Gulf of Mexico on a variety of Jet Ski tours. Select the date and time of your ideal adventure. We offer real-time booking results so you know exactly when you or your group can ride. Finalize your booking and we’ll send you a digital receipt. Arrive at The Key West Inn before your ride time so we can get everything squared away and you can adventure as fast as possible! A fun, fast, and relaxing way to enjoy the scenery — take it all in at speed as you traverse open water, or slowly cruise through mangroves or past the reefs. Easy fun for the whole family — since you can control your speed and fit multiple people on a single craft, jet ski rentals are a great way to get the whole family involved. Heart-healthy enjoyment — the speed of a jet ski can be a great way to get the blood pumping and give yourself a burst of adrenaline. So, while it’s not going to cure heart disease, jet skiing is a fun way to give your heart a bit of a boost. Muscle benefits, too — the balance necessary to ride a jet ski engages muscles throughout your body, especially in your core. Don’t go expecting six-pack abs just from jet skiing, but it is a fun way to give your muscles a bit of a workout. Natural stress relief — between the fun, the sun, and the refreshing spray of the water, jet skiing is a great way to give your brain a break. Whether you’re tearing across open water or taking a slow jaunt through the mangroves, jet ski trips can provide some pretty awesome mental benefits. Coordination and balance boosts — jet skiing engages muscle groups in a combination you probably don’t use often. You’ll need to concentrate on coordinating your limbs and the jet ski to stay balanced enough to stay on board. If you’ve never been jet skiing before, not to worry! Follow these tips to get prepared, grab the gear you’ll want, and be ready to enjoy the ride! Going jet skiing isn’t like a raft ride at a theme park — the ride that’s on water but barely splashes you. When riding on a jet ski, you will get wet. Yes, even if you don’t fall off the jet ski and topple into the ocean. So when you’re getting dressed for your jet ski tour, plan for moisture to happen. Grab a swimsuit plus shorts and a top you don’t mind getting drenched by salt water. Quick-dry athletic clothes are a pretty good option, since they are designed to dry quickly. Also, don’t forget water-appropriate shoes! Grab a pair of water-appropriate sandals with straps, water shoes, or just plan to go barefoot. We do recommend a rubber-soled shoe with some tread to give you a better grip and help with balance. While we’re at it, there are a few clothing items that will make your jet ski adventure less comfortable. Skip really loose-fitting clothing. There will be wind and spray, and you don’t want to lose your shorts or have your shirt constantly blowing in your face as you ride. You’ll also want to skip the flip-flops since they don’t provide any traction. The jet ski surface will get wet, and flip-flops will make it easier to slip around and lose a shoe. You’d be better off going barefoot or wearing water shoes of some kind. Of course, the other reminder about what to avoid wearing is anything that isn’t waterproof or water appropriate. If your watch isn’t waterproof, leave it at home for the day. The same goes for jewelry; if you don’t want to lose it, you may want to leave it safely at home. There’s no good way to search for a lost necklace in the ocean, after all. You won’t need much on your jet ski adventure. You may want to grab a dry bag for your car keys, wallet, and any other items that aren’t waterproof and can’t be left behind. For safety’s sake, you’ll also want to grab life jackets if you have them. If not, you can get them in our shop. Whether you burn easily or not, you’ll probably want appropriate sun protection. If you’re bringing hats or sunglasses, however, be sure you’ve got straps or cords to help keep them in place. You wouldn’t want the wind knocking them away! Sunscreen, sunscreen, sunscreen! The cool spray of water may make you forget, but the sun will be beating down during your time on the water. You can still get burned, even if you don’t feel your skin heating. Have everyone in your group slather on the sunblock before your jet ski rental starts, so it can soak in and start providing protection. If you’re going on a multi-hour jet ski trip, you’ll want to bring a thing of sunscreen with you to re-apply as needed. Otherwise, there isn’t much else you should need. You may want to grab some snacks and water to drink, but they’ll need to go in the storage compartment (maybe in a dry bag), so accessing them may not be very easy while you’re adventuring. If you have any other questions on how to prepare, give the Keys Skis & Adventure team a call! We’ll be happy to provide you with tips and suggestions based on our experience. Book Your Jet Ski Adventure Now! Enjoy Your Jet Ski Rental! Here at Keys Skis & Adventure, we want to help you have the best time possible. We can answer any questions you have and help you plan the perfect jet ski adventure for your group. Don’t worry about experience, either. We’ll teach you what you need to know and make sure you’re comfortable before you head out to explore. Don’t miss out on this staple of South Florida fun! Book online or give us a call today to schedule your jet ski rental!